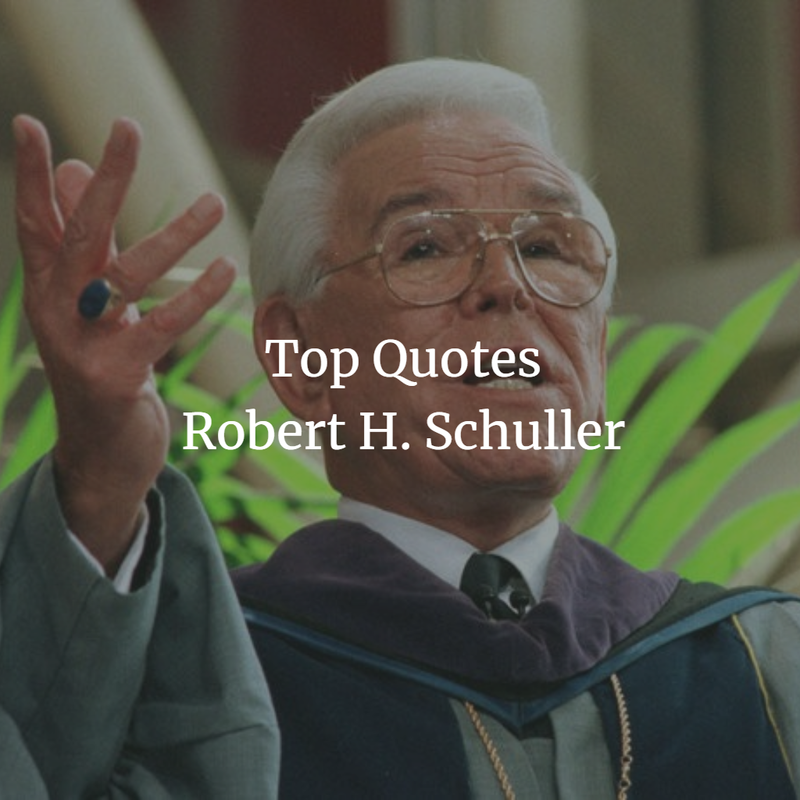 who is Robert H. Schuller? 1. Commit yourself to a dream nobody who tries to do something great but fails is a total failure. Why? Because he can always rest assured that he succeeded in life's most important battle -- he defeated the fear of trying. 2. Yes, you can be a dreamer and a doer too, if you will remove one word from your vocabulary: impossible. 3. You can often measure a person by the size of his dream. 4. Build a dream and the dream will build you. 5. Always look at what you have left. Never look at what you have lost. 6. Commit yourself to a dream... Nobody who tries to do something great but fails is a total failure. Why? Because he can always rest assured that he succeeded in life's most important battle--he defeated the fear of trying. 7. If you listen to your fears, you will die never knowing what a great person you might have been. 8. Impossible situations can become possible miracles. 9. It takes but one positive thought when given a chance to survive and thrive to overpower an entire army of negative thoughts. 11. Every achiever I have ever met says, "My life turned around when I began to believe in me. 12. Anyone can count the seeds in an apple, but only God can count the number of apples in a seed. 13. Most people who succeed n the face of seemingly impossible conditions are people who simply don't know how to quit. 14. Life is but a moment, death also is but another. 15. Better to do something imperfectly than to do nothing flawlessly. 16. Again and again, the impossible problem is solved when we see that the problem is only a tough decision waiting to be made. 17. What great thing would you attempt if you knew you could not fail? 18. The only place where your dream becomes impossible is in your own thinking. 19. Never cut a tree down in the wintertime. Never make a negative decision in the low time. 20. What would you attempt to do if you knew you could not fail? 21. Failure doesn't mean you are a failure... it just means you haven't succeeded yet. 22. Goals are not only absolutely necessary to motivate us. They are essential to really keep us alive. 23. Inch by inch, it's a cinch. 24. When you can't solve the problem, manage it. 25. Never bring the problem-solving stage into the decision-making stage. Otherwise, you surrender yourself to the problem rather than the solution. 26. Problems are not stopped signs, they are guidelines. 28. Let your hopes, not your hurts, shape your future. 29. Possibilitizing is overcoming while you're undergoing. 30. Always look at what you have left. Never look at what you have lost.